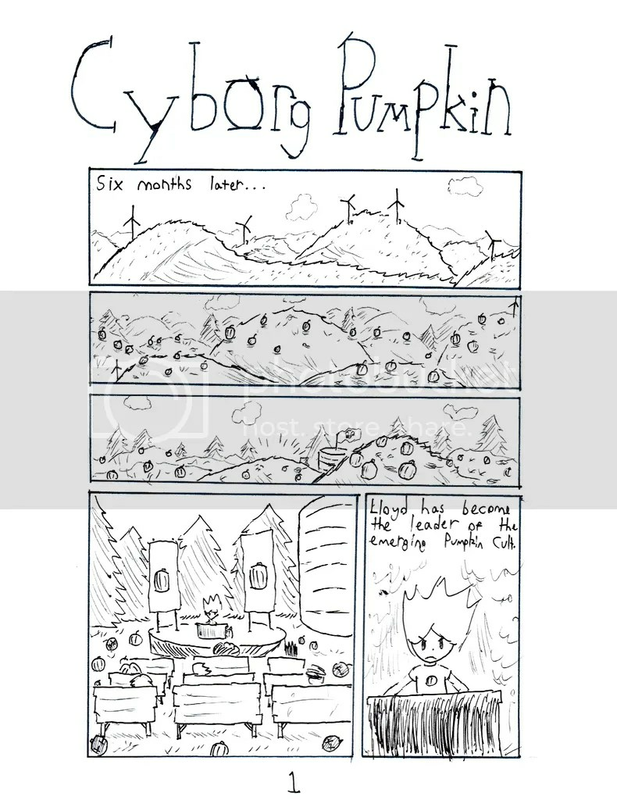 Here are the first two pages of the next chapter. 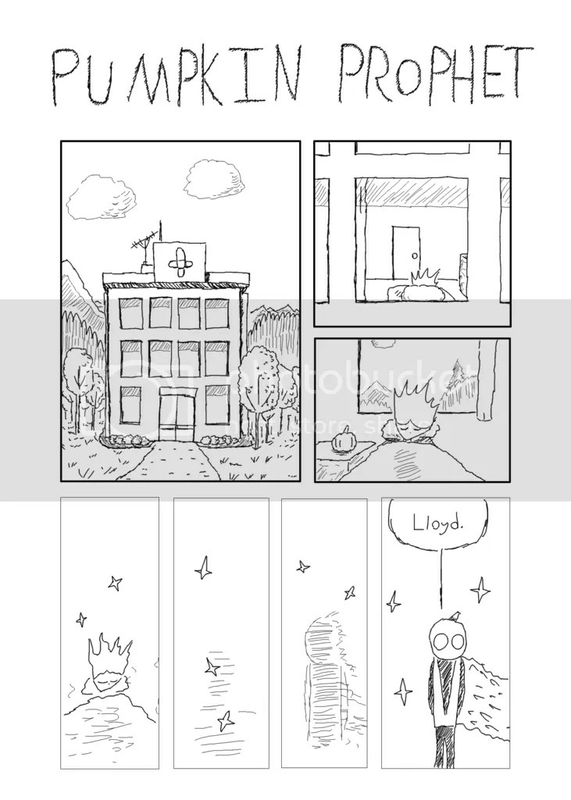 This is Lloyd’s second dream. What do you think of those weird backgrounds? Sorry it’s been so long. I’ve been doing summer school. Both of these pages were drawn during class. Sorry for the mediocre quality. 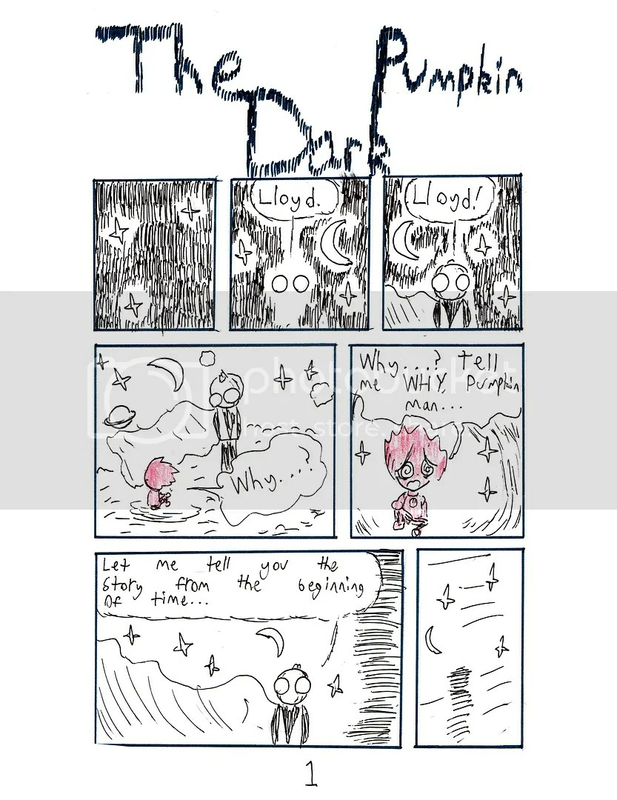 This entry was posted in Comic Update, Pumpkin Man and tagged art, birth, brothers, comics, cult, dreams, episode, food, god, Lloyd on July 11, 2015 by Dean Yockey. A new chapter has started. Here’s page 1. You can read the story thus far here, or by clicking on the image. Sorry for not posting again sooner. I was on vacation during the weekend of spring break, and vacation makes you irresponsible. This chapter is titled “Cyborg Pumpkin.” I wonder why. Do you know why? This entry was posted in Comic Update, Pumpkin Man and tagged art, comics, cult, drawing, episode, farming, pumpkins on April 14, 2015 by Dean Yockey. Hello. I’m back to Pumpkin Man now. You can read the story thus far here, or by clicking on the image. The first panel alone took about an hour, but those last four probably got done in 30 minutes. I’ve almost got the next page done, too. I’m going to try to keep the art quality up better than I did with Shadow Wide. I’m also going to try to focus much more on the story. 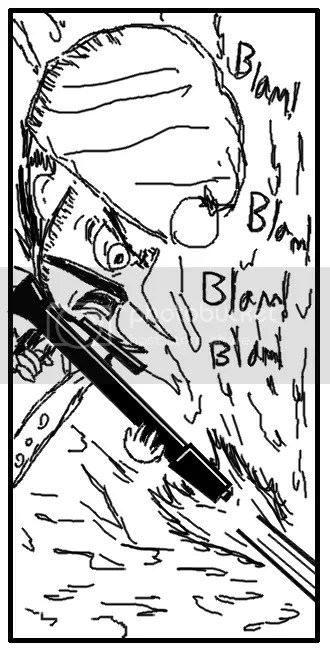 The initial pencils of Shadow Wide were done in 12 hours, so I didn’t have the ability to think through the story a lot. I’m also going to try to post these more often. It’s only been two days since I posted the cover of Shadow Wide, and this is already finished. Maybe I’ll get up to twice per week during school. During summer I’ll probably be able to post nearly every other day. We’ll see. This entry was posted in Comic Update, Pumpkin Man and tagged art, comics, drawing, dreams, episode, hospital, surreal on March 15, 2015 by Dean Yockey. Hello. 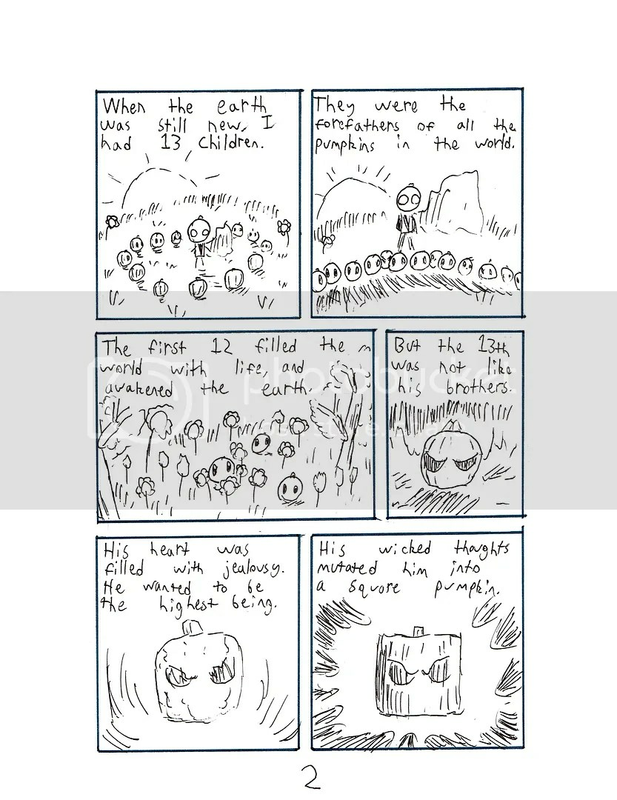 Here is Page 4 of the second chapter of the Pumpkin Man series. It’s twice as long as chapter one so far, and I’ll probably end chapter 2 on the next page. You can read the story thus far here. Sorry if the terrorists aren’t always drawn the same way. Consistency is still hard for me. As you can see, this page has multiple pure-black backgrounds, instead of shaded ones. While it may seem like trivia to some, I feel like these black backgrounds are a staple of the series, compared to Shadow Wide, which has a lot of shading. This page also has a lot of subject switching and close-ups, so it feels almost like a manga to me, except the characters are bearded men instead of pretty-boys. This page’s layout feels a bit too squeezed to me. I’ve often felt the need to loosen up in my layouts. This page ends in a smash. The pumpkin the terrorist broke earlier went smash, too. It must have been an expensive pumpkin. This entry was posted in Comic Update, Pumpkin Man and tagged art, comics, drawing, episode, food, super hero on November 30, 2014 by Dean Yockey. Page three is finished. Remember, this isn’t the actual page, but just an excerpt from the page. Click on the picture to read the actual comic. Surprisingly, it hasn’t been more than a week since my last post. I guess I’m back on track. I drew this page a bit faster than the previous ones. Click on the image to go to the page where you can read it. Sorry that you have to scroll down. I could just post a whole page instead of a panel, but I don’t want to give too much away if you haven’t read everything before it yet. Please don’t like this post if you’re not going to read the actual comic. This entry was posted in Comic Update, Pumpkin Man and tagged birth, comics, drawing, episode, food, super hero on October 28, 2014 by Dean Yockey. Here comes page two! Click this link, or the picture, to go to the page. You’ll have to scroll down. Sorry that it’s taken so long for page two. The actual drawing didn’t take too long, but I just had trouble finding time and focus to work on it. I spent an hour on the panel above, since I redrew the gun and the background. I didn’t put that amount of work into the other panels, though. I have the most trouble drawing Lloyd (the boy). Although he’s simpler than the terrorists, he’s less geometric, making it hard to keep him consistent looking. This entry was posted in Comic Update and tagged art, comics, drawing, episode, food, super hero on October 12, 2014 by Dean Yockey. I finished page one of episode two of the Pumpkin Man series. You can find it on the new page dedicated to the series. I’m sorry I don’t have a whole comic to post, but now that school has started up, I don’t have as much time to work on my comics. I’ll have to post one page at a time for a while. Please bear with me. 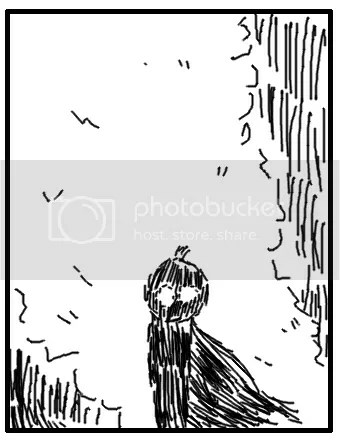 Sorry that I only show one panel from the page, but I want people to go to the page, just in case they haven’t read the previous pages (I wouldn’t want people to read it out of order). While you are reading it, please listen to either very somber music, or very goofy music. This entry was posted in Comic Update, Pumpkin Man and tagged art, comics, episode, food, super hero on September 22, 2014 by Dean Yockey.